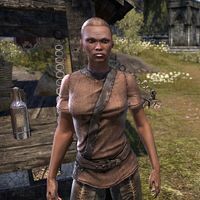 Ahya is a Redguard merchant selling her wares at her stall, Dockside Sundries, in the city of Evermore. She welcomes you by saying, "Blessings be upon you. I apologize for my sparse stock, but we must take heart. In times like these even trifles feel like treasures." This page was last modified on 13 July 2018, at 07:14.